How to Get Away With Murder Season Finale Recap: Laurel LoyaltyLet’s hope next season opens with Annalise relaxing on a beach while everyone else sits in jail. 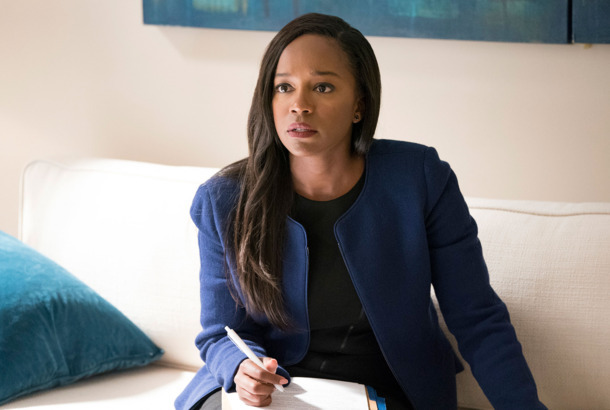 How to Get Away With Murder Recap: Law of AttractionAnnalise thinks Emmett wants to destroy her, but fortunately, he also wants to bang her, and she’s going to use that to get answers. How to Get Away With Murder Recap: The InformantWelcome to the All Scheming, All Plotting Annelise Keating Variety Hour. How to Get Away With Murder Recap: Burden of ProofThe only thing HTGAWM loves more than the law is a good scheme, and this episode is full of ‘em. How to Get Away With Murder Recap: Blood RelationsWith all the permutations of possible murders on this show, murdering the wrong person entirely seems like an inevitability. How to Get Away With Murder Recap: Past SinsDo we need more evidence that Sam is bad? WE GET IT. How to Get Away With Murder Recap: Love and MurderThe 24 hours leading up to and through Oliver and Connor’s wedding include two big but low-impact revelations. How To Get Away With Murder Recap: Governor BasicAnnalise’s time with the Fair Defense Project comes to an unsatisfying, confusing conclusion. How to Get Away With Murder Recap: Burgers and BigotryNate’s quest continues as the firm deals with a burger chain run by racists. How to Get Away With Murder Recap: Baby Come BackThe search for Bonnie’s baby continues and hits a strange twist. How to Get Away With Murder Recap: A Case of Vehicular HomicideAnnalise takes on a fascinating case while elsewhere Laurel can’t find childcare. Fresh Off The Boat, Black-ish, Shondaland Shows Among ABC’s Returning TV SlateThey join new shows like Whiskey Cavalier and Grand Hotel. How to Get Away With Murder Season Finale Recap: Let Annalise Live!All I want is Viola Davis in a series of responsible-looking wigs delivering passionate monologues. How to Get Away With Murder Recap: Wes Side StoryIt’s a very emotional day for Annalise and the Gang. Why the Scandal–HTGAWM Crossover Is So UniqueOlivia Pope’s partnership with Annalise Keating isn’t just a prime-time gimmick. How to Get Away With Murder Recap: The People’s CourtCan Kerry Washington be on this show every week? How to Get Away With Murder Recap: How to Survive a ScandalOlivia Pope has entered the picture! How to Get Away With Murder Recap: Mommy IssuesSacrebleu! What does Laurel’s mom have to do with Wes? How to Get Away With Murder Recap: While You Were SleepingThis is one of those episodes where HTGAWM is setting up the craziness to come. The Scandal—HTGAWM Crossover Will Have So Many Power HandbagsSee Olivia and Annalise together for the first time. How to Get Away With Murder Recap: Baby DramaIt was only a matter of time before Laurel’s dad showed up and ruined everything. Hallelujah! A Scandal–HTGAWM Crossover Episode Is HappeningThank you Mother Earth, a.k.a. Shonda Rhimes. How to Get Away With Murder Recap: The BabyHow were they allowed to show that on television? How to Get Away With Murder Recap: Do It for WesWe get it, Laurel. You hate your dad. Let’s move it along. How to Get Away With Murder Recap: Letters to SamJimmy Smits just wants the best for everybody. How to Get Away With Murder Recap: Women in SuitsWhy am I forced to do anything other than watch amazing women in amazing suits destroy puny little men in the courtroom? How to Get Away With Murder Recap: The Greater GoodThis isn’t an episode of Law & Order: SVU, but this is my favorite episode of Law & Order: SVU. How to Get Away With Murder Recap: The Job HuntForget the Keating Gang. All I want is Jimmy Smits and Viola Davis caught in a battle of wits. How to Get Away With Murder Season-Premiere Recap: Class DismissedDid Annalise steal Laurel’s baby? How to Get Away With Murder Season Finale Recap: Who Killed Wes?Someone is literally getting away with murder! How to Get Away With Murder Recap: Fix ItIt took three seasons, but Bonnie Winterbottom finally grew a backbone. How to Get Away With Murder Recap: Twist After TwistCicely Tyson is an American treasure. How to Get Away With Murder Recap: Quite FranklyAnother masterclass in wig-and-weave acting by Viola Davis. Brian Tyree Henry Books Guest Role on HTGAWMHopefully he will not be murdered. How to Get Away With Murder Recap: Locked Up“We’re Bad People” is an acting tour de force. 29 Very Black Things That Happened on TV in 2016Beyoncé’s Super Bowl performance, Atlanta’s Juneteenth episode, and so much more. How to Get Away With Murder’s Alfred Enoch on That Big MomentSorry, Wes. How to Get Away With Murder Recap: Under the SheetDoes anyone feel invested in Wes and Laurel’s relationship? How to Get Away With Murder Recap: Mommie DearestTime is running out for Annalise. How to Get Away With Murder Recap: Back in ActionDoes anyone on this show know when it’s appropriate to talk about relationship milestones? How to Get Away With Murder Recap: Let’s Be FrankAnother week, another flashback-filled episode. How to Get Away With Murder Recap: Anna and EveThe statuesque Famke Janssen returns to HTGAWM. How to Get Away With Murder Recap: You Don’t Get to ComplainUgh, dads. How to Get Away With Murder Recap: As Long As It’s LegalWes can’t protect you from Frank, Annalise!